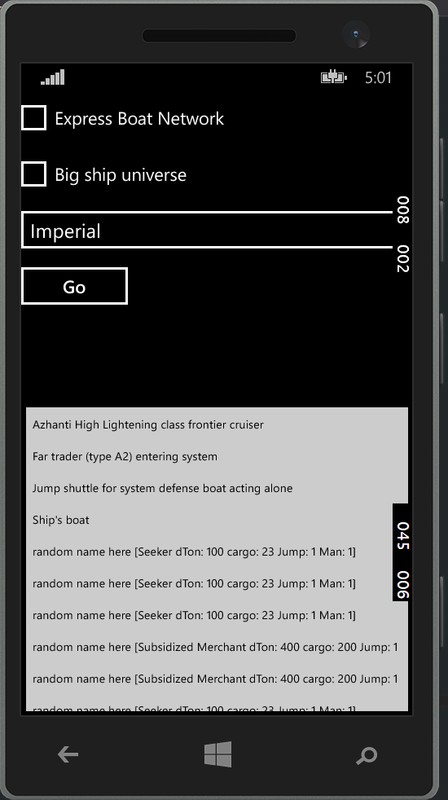 I've decided to play with Universal Apps, so I am writing a Win Phone/Win 8.1 program to generate random starship encounters. Phase 1 is actually complete: I've replicated the Supplement 7 Starship Encounters. Phase 2 is a tad more ambitious: you'll be able to select the world location and based on the UPP, and options such as location (Imperial, etc) and if you pick a small or large ship universe, it will generate a bunch more random encounters. Phase 3 is taking the universal part and sticking it into a web site at some point. However, my web development is sorely lacking in the modern era. Going a bit aboveboard: the encounters beyond Supplement 7 actually detail the ship a bit more, and the plan is to allow users to add their own ship classes into the mix. Details in the models so far include name, class, type, tonnage, cargo tonnage, age, jump, maneuver and a crew listing (a list of crew models - its turtles all the way down!) The idea is that you could select one of the random encounters to get more detail. How long will this take? Knowing me, I may never finish. I already program 8 hours a day for work family time is more important. The trade program was developed when I got laid off - plenty of time!